Dune Buds are small plants found only on Gelato Beach in the game Super Mario Sunshine. 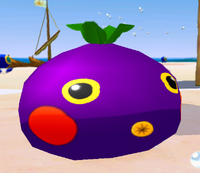 Initially appearing as a tiny purple bud sticking out of the ground, the player can spray them with water from F.L.U.D.D. to cause them to grow up extremely rapidly and then turn orange before causing a specially-shaped sand dune to pop up on the beach for a few seconds. This can be used to the player's advantage, in order to acquire normally unreachable midair formations of Coins, destroy Cataquacks, or damage the giant green Wiggler boss during Episode 3. Instead of becoming raised up when sprayed with water, some Dune Buds form indented pits that hide items like Coins, Blue Coins, or even Shine Sprites. There are a total of nine different Dune Bud shapes found on Gelato Beach. The location of each Dune Bud occasionally varies depending on the episode that the player visits the beach in, and in a few episodes, some Dune Buds are not present at all. The shape of each Dune Bud along with their various locations are listed below. Footprint To the left of the Sand Cabana To the left of the Sand Cabana To the left of the Sand Cabana To the left of the Sand Cabana To the left of the Sand Cabana To the left of the Sand Cabana. It's also blocked by a forcefield. To the left of the Sand Cabana. It's also blocked by a forcefield. To the left of the Sand Cabana. It's also blocked by a forcefield. This page was last edited on December 2, 2018, at 20:03.